There are all types of excellent blogs and guides to the Grind written by twiggy fitness experts; this is not one of them. Here are 10 essential tips everyday Moms need to know to survive their trips up the mountain. My 12-year-old is a Type A man-child who views his summer as having one purpose: to cross train for the upcoming hockey season. But knowing that a single week of hockey camp (consisting of 7.5 hours of ice time and the same amount of dry land training) can set me back almost $500, I knew I would have to get creative. 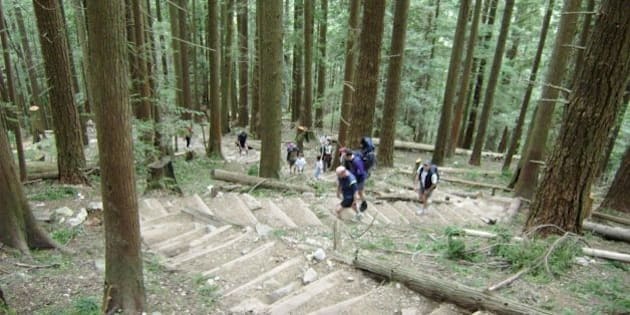 I did some reasearch and learned that a $40-pass could get my son unlimited access to the Grouse Grind for a year and offer him the same workout as many hockey pros. Just one little problem: I would have to go with him. There are all types of excellent blogs and guides to the Grind written by twiggy fitness experts; this is not one of them. Here are 10 essential tips everyday moms need to know to survive their trips up Mordor. 1) The mountain doesn't lie. It's a fantastic gauge and measure of your current level of fitness. Last year I could do this hike in an hour. Last week, on my first trip of this year, it took me 95 minutes! Maybe this soccer fan needs to come out of the net and chase the ball next season! However, 10 days and five trips later, I'm down to 75 minutes and see tangible improvement each time I go. 2) The first part is the hardest and feels like the longest. You're going to want to turn around and wait for your child in the car. But remember, in those first few hundred steps, you are quickly increasing elevation and bringing your heart rate up to what feels like its maximum. And once you get there, you can better pace yourself, so be patient with yourself at the beginning. 3) Practice (childbirth) breathing. This really helps to fight off any cramps or fatigue, especially on the first part of the hike. Don't worry, everyone else breathes hard, too. 5) Stay humble. Really humble. You're going to be passed by a steady stream of much older people who do the Grind daily and they're fast old birds. Today I was passed by a man who looked 80, and I joked that I'd be on his heels for the rest of the hike. I wish. He grinned and blew past me. My pre-teen bounces up in 50 minutes and I only see his back for the first 20 seconds of our hike "together." 6) Wear as little as possible. Most women do the Grind in shorts, a yoga tank top, light trail runners, and ankle socks. Resist the urge to bring a jacket; if you're cold when you get out of the car, don't worry: you won't be for long. 7) Haul as little as possible. I carry my pass and truck key in my pocket, with two water bottles in a light cloth back bag. Other people wear fitness belts. Most people carry nothing, as in nothing. Speaking of which, don't forget to use the bathroom in the parking lot. 8) Fuel smart. We go early before it's hot and crowded. An oatmeal breakfast with fruit is perfect for providing us energy during the hike. Protein pre-hike won't give you the energy to get you up the hill; it takes too long to digest (and makes you feel like you want to throw up). Sports drinks were designed to help you; use them for quick energy. 9) Get out of the way. Most people are on the Grind to beat their personal time, so if you hear someone on your heels, step off the path briefly to let them pass. My first two times involved looking for places to stand or sit every 100 metres. It's hard to say if that really helped because it made it more difficult to get back into a rhythm, although it was nice to rest. A week later and I don't need to stop anymore. The body adjusts quickly. 10) Watch out for those endorphins. After a few times on the Grind, you'll start counting the days until you can get up there again. You'll quickly crave the intense rush of adrenaline when you're finally done, the proud look of your child's face as he notes your improved time, the view from the top, and the awesome glow of your skin, even days after. The Grind makes a quick difference in how you feel, the ease with which you run (or your child skates), and the shape of your body. While swimming, biking, and yoga can take longer to see big results, the mountain doesn't hold back huge benefits once you pay it a few visits. Know this: it's murder the first couple of times, and then it's all uphill. Eventually your body acclimatizes and rises to the challenge. Just like you, Hockey Mom. Go take a hike!